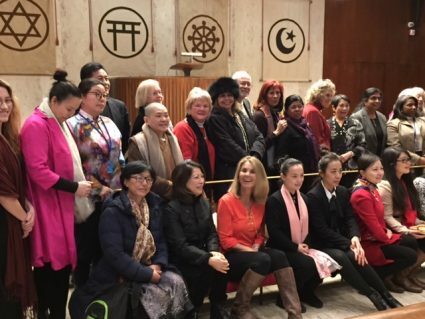 The World Peace Prayer Society ( WPPS) co-sponsored the 3rd Annual Service of Gratitude and Remembrance during the UN Commission on the Status of Women at the chapel of the Church Center for the United Nations, along with partner organizations The Parliament of the World’s Religions, Temple of Understanding, Interfaith Center of New York, International Yoga Day Committee at the UN, United Religions Initiative, and United Methodist Women. This service of prayer and reflection honors the women who have gone before, leaving their indelible mark through dedicated service to humanity. 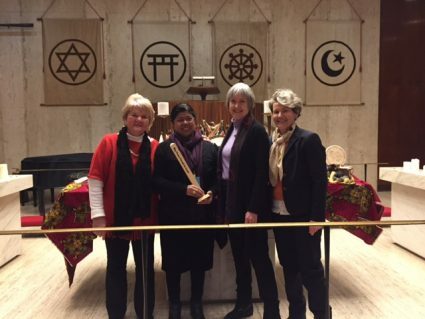 Chaplain Dionne Boissiere created a beautiful altar that included a mini Peace Pole, and Monica Willard of the URI invited everyone to name a woman who had inspired us before her passing and inscribe the names in a book. A highlight of the program was by flautist Brandon Perdomo, who serves as WPPS Youth Representative to the UN, performing several musical numbers with percussionist Caitlin Cawley. At the close of the service, Monica suggested a group photo and Sande Hart, of the Compassion Games International, called out for everyone to say, “May Peace Prevail on Earth!” A woman named Rachel Bachenberg then approached Rev. 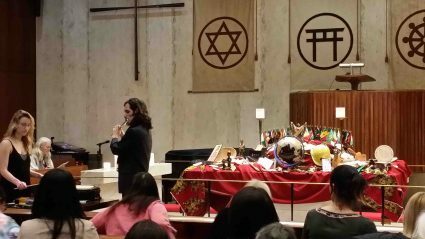 Deborah Moldow, WPPS UN Representative, to tell her about the Peace Pole at her church, Keystone United Methodist Church (formerly Broadway UMC) in Kansas City, Missouri, and how much it meant to the congregation. Deborah and Monica co-hosted a small dinner to honor some of our special colleagues who were present for the event, including Sabina Rifat, who runs the programs for women for URI Pakistan. Together with Fr. James Channan, she has planted more than 60 Peace Poles all over Pakistan! 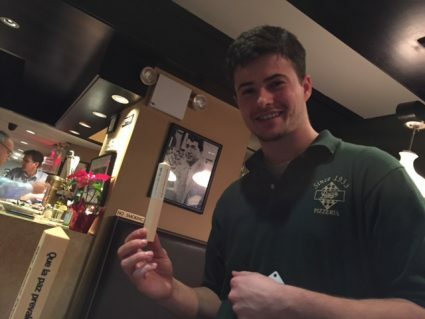 Deborah placed a desktop Peace Pole on the table at dinner, causing a young waiter to come up and tell us about the Peace Pole that is at his high school on Long Island, NY. He was so excited to tell us and to meet all of us that Monica gave him a mini Peace Pole. It is sincere young people like him who will take peace forward into the future.